In view of the vast movement of Europe in the sixteenth and seventeenth centuries, it is hardly surprising that both the largest number of revolutions of the early modern epoch as well as the biggest occurred during this period. The eighteenth century until near its end was much less subject to upheaval than the two preceding centuries; and within the latter it was the time span from about 1520 (the revolt of the Comuneros in Castile) to 1660 (the exhaustion of the revolutionary disturbances of the midcentury) that presents us with both the greatest frequency and the most important cases of revolution. Between 1500 and 1660 the three states that occupied a paramount position as great powers in Europe were England, France, and Spain.2 Their rivalries and alliances played the largest role in determining the pattern of European international relations; their conflicts were responsible for the biggest wars.3 Individually, of course, as seen at the level of discrete events and succession of leading personalities as well as of particular institutional configurations, each of the three has a different and quite distinct history. But looked at in a wider view and at a certain level of generality, they present various common features, are seen to be played upon by similar forces and to undergo parallel experiences. This is the case not only because they belong to the same civilization and reflect its problems and characteristics as it emerged from the Middle Ages. (Here we may profitably recall Lucien Febvre’s insistence in connection with the French Reformation that even its specificity and national traits are intelligible only in a European context, the countries of Europe, despite their originality and distinctive traditions at the beginning of the sixteenth century, having all shared a common spiritual culture for centuries. )4 Also, and in a more particular sense, the history of these states reveals to us every stage and all varieties of early modern political and social development. Correspondingly, therefore, it gives us also a substantial representation of the possible types and processes of revolution that are congruent with and consequent upon early modern political and social structures. Let us cast a rapid glance at the monarchies of these states and their European dominions during this period, which begins with the three contemporaneous reigns of the Tudor Henry VIII in England (1509-47), the Valois Francis I in France (1515-47), and the Habsburg Charles I in Spain (1516-56). In England, the Tudor dynasty continues to rule during the sixteenth century. The kings of England are also kings of Ireland, which has long been subject to the English crown. In 1603, at the death of Queen Elizabeth I, the Scottish Stuart dynasty succeeds the Tudors with the accession of James I, and England is thenceforth connected to Scotland by a personal union of crowns. In France, the line of Valois kings occupies the throne until its extinction by the murder of Henry III, in 1589, when it is succeeded by the house of Bourbon in the person of Henry IV The French monarchy, although ambitious for Italian conquest in the first half of the sixteenth century, fails in this attempt and has no kingdoms outside France under its rule. The state it governs expands mainly by internal consolidation and integration and by annexation on France’s frontiers rather than by foreign acquisition or by dynastic association with other realms. In Spain, kings of the Habsburg dynasty succeed one another during the entire period. Their state is the most farflung and the most diverse. Besides its enormous transoceanic possessions, Spain is also an empire in Europe. In peninsular Spain, Charles I (who is commonly known to history as Charles V due to his election in 1519 as Holy Roman emperor) is ruler of the kingdoms of Aragon and Castile, held through inheritance in a union of crowns. To these Iberian dominions his son, Philip II, adds the crown of Portugal in 1580. In the Pyrenees, the Spanish monarchy is master of the kingdom of Navarre. Outside the peninsula it possesses in Italy the kingdoms of Naples and Sicily, both derived through the crown of Aragon, and the duchy of Milan. As emperor and head of the Habsburg house, Charles I and V also links Spain to Germany and to his Austrian family possessions, but this connection does not outlast his time, after which the Spanish and the Austrian Habsburgs form separate branches ruling over his divided inheritance. Finally, in Northern Europe, Charles, as duke of Burgundy and by other titles, brings to the Spanish monarchy the lordship of the provinces of the Netherlands and of Franche-Comte. All these domains are politically distinct, possessing their own institutions and united only through the person of the sovereign to whom each owes allegiance. The Spanish monarchy must accordingly create institutions of imperial government in order to administer and coordinate its disparate realms. 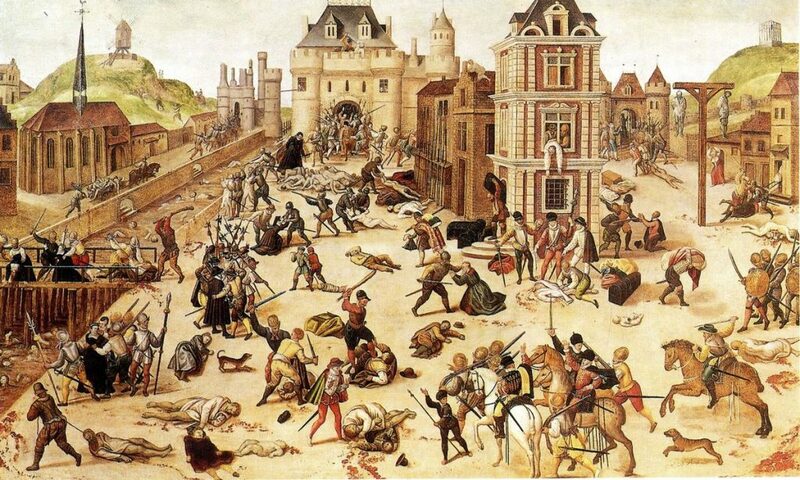 French Wars of Religion (1562-1598): St. Bartholomew’s Day massacre by Huguenot painter François Dubois. The painting depicts Admiral Coligny’s body hanging from a window at the rear to the right. To the left rear, Catherine de Medici is shown emerging from the Louvre castle to inspect a heap of bodies (Wikipedia). Such is the site of the sixteenth- and seventeenth-century revolutions that may fall within our consideration. Next, we should try to gain a view of their occurrence and incidence in time and space. At present, save in part for the work of Sorokin shortly to be noticed, there is not available any census of revolutions either worldwide or for a particular society and offering quantitative information on their various aspects and characteristics.5 Even for our restricted period, insufficient and untrustworthy evidence would make it difficult to compile a complete census of revolutions along with accurate data on their duration, spatial extent, participants, goals, victims, and so forth. This difficulty is compounded by the fact that historians have failed to agree in their definitions of revolution or in their classification and description of its different types. With respect to completeness, the parts of the tables covering the century and a half of our study reveal a number of omissions. I shall not attempt to list them because in later chapters I note the occurrence of the several types of revolution, but I shall cite some examples. The most numerous omissions relate to France. The detailed surveys by Porchnev, Bercé, and Pillorget record many disturbances and revolts that are not included in Sorokin’s census. Among them are various agrarian (peasant) and urban insurrections, especially during the decades of the 1630s and 1640s, as well as such provincial rebellions as that of Languedoc in 1632 and Normandy in 1639. In the case of England, the tables omit the Western (Prayer Book) rebellion of 1549 and the agrarian insurrections of 1607 and 1628. They also overlook the Irish rebellion of 1641, despite their inclusion of previous (although not all) less important Irish rebellions in the table pertaining to England. In the case of Spain and its possessions, among the omissions are the revolts of Portugal in 1640 and of Naples and Palermo in 1647. Generally speaking, Sorokin’s graphs and tables do not contain any revelations. No trends or periodicities, as he points out, can be deduced from them, nor do they suggest any significant correlations. They may be helpful, however, in gaining an approximation of the number and frequency of internal disturbances — or at least those that a variety of detailed narrative histories deemed important enough to record for the countries tabulated. Several figures relative to the sixteenth- and seventeenth-century revolutions are worth noting. Finally, it appears from Sorokin’s data that about 80 percent of the 1,544 disturbances from 500 B.C. to A.D. 1925 had a duration of less than a year. Further, “for the majority of countries taken separately the predominant type of disturbance is … of a few weeks’ duration.”22 I see no reason to doubt the substantial correctness of this conclusion or its applicability to the revolutions of the early modern era, although there are of course very notable exceptions and the importance of a rebellion is not necessarily measured by its length. Summing up, a brief conspectus of the course and highlights of revolution between 1500 and 1660 in England, France, and the Spanish empire shows that each was subject to a number of revolutions ranging in scale from small to very large and with some common types, as we shall see, occurring in all three. 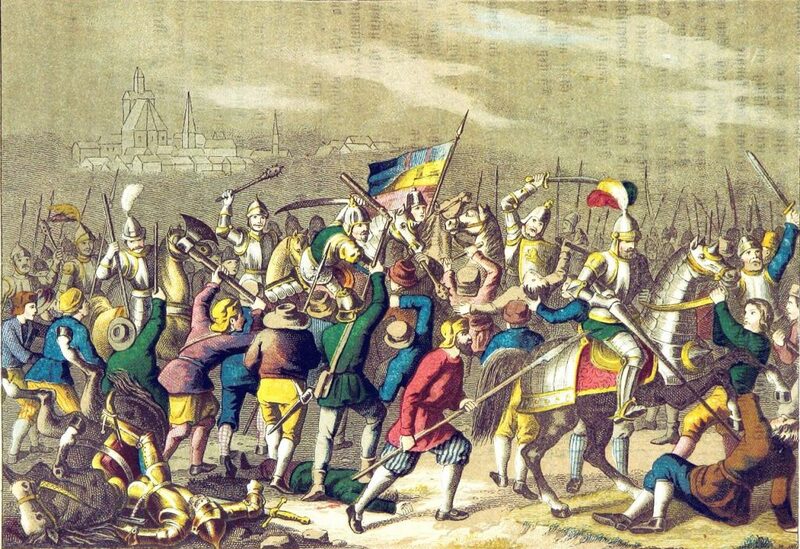 In England the largest rebellions of the sixteenth century were the Pilgrimage of Grace in 1536 and the Norfolk or Kett’s agrarian rebellion in 1549. The biggest and most important of all came at the end of the period in the revolution of 1640-60, which was also associated with big revolutions in the two other kingdoms of the English crown, Scotland and Ireland. In France, which experienced by far the greatest number of rebellions, the biggest and most important of them occurred in two phases, separated by half a century, the first being the civil war of the later sixteenth century from 1562 to 1598, the second the Fronde in the years 1648-53. In between, and apart from these two largest upheavals, various other rebellions of a more limited character broke out with epidemic frequency in the earlier seventeenth century. In the Spanish monarchy, the biggest and most consequential revolutions were separated both in time and in the dominions where they occurred. The first was the revolt of the Comuneros in 1520 in the kingdom of Castile, the very heart of the monarchy; the second followed half a century later in 1566, with the rebellion of the Netherlands. At the end of the period, an outburst of contemporaneous rebellions during the 164os in Portugal, Ca-talonia, Naples, and Sicily was a symptom of the crisis of the Spanish state, which announced the decline of Spain as a European power. Needless to say, I do not propose to consider all the revolutions that took place within the rule of the English, French, and Spanish crowns during the period. Such an undertaking would be impossible and, even if possible, probably of little interest. What is important is to ascertain the types or structures included in the spectrum of revolution in early modern society and to examine some well-selected cases in order to bring out com-parative and individual features. 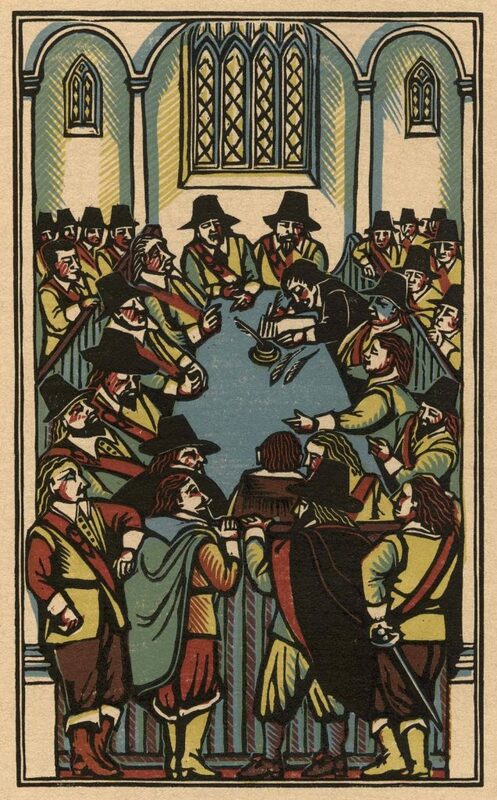 THE PUTNEY DEBATES of 1647, immortalised by Leveller sympathiser, Thomas Rainborough, who stated: ‘I think that the poorest he that is in England, has a life to live as the greatest he’. At first view, a bewildering multiplicity of revolutions within an almost infinite diversity of circumstances presents itself to the comparative historian of revolution in early modern Europe. Is it possible to discern in this multiplicity a limited number of types representing the general features, forms, and structures of revolutionary action at this period? This, the typological problem, has always been of vital concern for the social sciences and comparative studies. Its centrality dates back at least as far as Aristotle’s effort to systematise the classification of polities and constitutions, and today one of the important issues in political science continues to be that of defining the types and characteristics of democratic and totalitarian regimes.24 Besides the development of typologies in the several social science disciplines, there has also been extensive theoretical discussion of the rationale of type constructs themselves, of Max Weber’s conception of the ideal type as a method of sociological investigation, and of typological constructs compared with models and model building and the respective properties of each in their representation of empirical reality and for use in research.25 History, moreover, even when not primarily comparative, has found it impossible to dispense with typological analysis. In his discussion of institutions, social structures, and cultures, the historian has no alternative in the face of the “infinite manifold” of the real but to make use of typological concepts. Although something can probably be learned from all these typological ideas, it is at the same time apparent that they presuppose different or unspecified criteria and represent various levels of abstraction, rising from what seems hardly more than a description of individual events to very broad taxonomies. Moreover, even a cursory view shows that the general typologies omit some types and misconceive others, whereas those referring more directly to the early modern period suffer from such defects as incompleteness, excessive generality, or procrustean reductionism. Whatever the final verdict on such views may prove to be, the reservations they express do at least justify the importance of trying to discover the nature and characteristics of revolution in historically different societies and hence also of the search for the types of revolutioi in early modern Europe. The rebel mentality, justifying beliefs, or ideology Although most of these criteria are probably reasonably clear, some amplifying comments may be helpful. The socioeconomic position of rebels refers to a variety of possible characteristics, including status or class, kinship, occupation, and profession, as well as, more generally, whether revolutionary actors are drawn from elites, from inferior strata, or from both. Geographic extent or focus is an essential criterion for early modern revolution, involving as it does not merely physical but political space. The kingdoms, states, and nations of sixteenth- and seventeenth-century Europe were as yet so imperfectly integrated politically and in other ways that local solidarities and communities, whether of villages, city, or town, province or region, could decisively affect the nature of revolution. Aims consist of rebel grievances and demands, the possible generalisation of demands into programs, and the changes that such demands envisage or imply. The targets of violence, whether persons or property and things, generally bear some relation or correspondence to the aims of the movement. Organisation is a relative phenomenon but is present in some degree, however rudimentary, in every revolutionary occurrence. Hence the criterion of spontaneity or calculation that has been suggested for the typological differentiation of revolutions is pointless, as spontaneity merely signifies a low or primitive level of organization.35 The relevant question is that of organizational forms, coordination, and leadership, and here considerable variety is encountered in the different types of revolution. Finally, mentality includes beliefs, values, and principles of right order in the world. The justifying claims or doctrines advanced in revolution will be a reflection or concretisation of such conceptions. One may speak of mentality, however, when the actuating beliefs and values are comparatively loose, unsystematized, and only partially explicit. Ideology, in contrast, represents a much greater elaboration of belief into articulated systems tending toward completeness and integration in accordance with their basic principles. In this sense, although beliefs and mentality may be traceable in any revolutionary event, their development in the direction of an ideology is less frequent and more characteristic of some types of revolutions than of others. In reviewing these criteria, it might perhaps be asked why, instead of those that have been indicated, we should not simply take the goals or magnitude of change sought by a revolution as its main or sole typological determinant. A glance at individual cases, however, indicates that no invariant connection exists between kind or scale of revolution and magnitude of envisaged change. Thus, a coup d’état, which is commonly regarded as the most limited of revolutions, can in certain instances aim not merely at changes in policy or government but at sweeping changes in regime or society. This is illustrated in the twentieth century by the modernising revolutions of Kemal Ataturk in Turkey and Nasser in Egypt, both military coups that initiated substantial social and political change.36 Similarly, the English Catholic Gunpowder plot of 1605, which attempted the assassination of King James I and many Protestant notables, or the military coup in 1650 by the Stadholder William II, prince of Orange, against the autonomy and preponderance of Holland in the Dutch republic, may both be seen as implicitly intending changes in regime.37 Moreover, the history of revolution in early modern Europe provides a number of cases of rebellions of different character that nonetheless demanded extensive political change. Since these differences are just as important in a comparative understanding of revolutions as are the goals sought, our typological criteria must take them into account. Using the criteria that I have suggested, we can derive a limited number of types of revolution in early modern Europe. An additional candidate for possible inclusion is the millenarian rebellion, which is often conceived as a distinct type of revolution and has been the subject of considerable attention in recent years.38 In the context of early modern Europe, however, I believe that the phenomenon of millenarian rebellion can be better understood as a projection within and modality of other types of revolution, and therefore I propose to treat it in that connection. What has been said in the previous chapter about the contribution of Marxism to the mythology of revolution applies no less to its idea of the “bourgeois revolution.” If the latter still looms large in accounts of revolution despite its inadequacies, this is because its main function is less that of historical clarification than to serve a particular version of the meaning of history. In the guise of a “law” of social development determined by the class struggle, the “bourgeois revolution” assumes its place as a stage within a teleological progression necessarily leading to the proletarian revolution and socialism as the next stage. The “bourgeois revolution,” as a historian of the French revolution calls it, is thus, “a metaphysical personage” that offers a “quasi-providential interpretation of events.”50 The teleology of which it is part, moreover, defines an ideal trajectory toward the future in relation to which persons and classes either fulfill or betray their “historic” mission, for this philosophy also pretends to know better than the historical actors themselves what their role, purposes, and aims should be. And it is surely only through devotion to the same philosophy that Marxist writers have ingeniously contrived to make the “bourgeois revolution” absorb within its elastic boundaries events as different in nature as the German peasant war and Reformation, the English and French revolutions, almost all the revolutions of 1848, the Risorgimento, the American civil war, the Russian revolutions of 1905 and February 1917, the Mexican revolution, and the precommunist phase of the Chinese revolution — a list that merely confirms its lack of usefulness as a type in the empirical comparative study of revolution. Furthermore, a typology consists of ideal types. It is therefore a set of constructions or, if one likes, “a coherent fiction to be measured against the real.”52 Each type is derived by a unilateral accentuation, a heightening, an abstraction of certain real properties in an intellectual operation that sets it a distance from the specific events known, for example, as the English revolution, the German peasant war, or the Netherlands revolt, to which it may refer and which the historian by a different intellectual operation is also able to bring before him in all their concrete particularity. Accordingly, in the type we obtain a constructed object, one to which no empirical case of revolution entirely corresponds, just as in many empirical cases there will be features associated with more than one type. From this it will be apparent that I reject the typological approach commonly adopted in discussions of revolution, whereby a particular historical instance is treated as the privileged or paradigmatic case and so becomes the model in relation to which either revolution in general or some restricted class of revolutions is to be understood. This method seems to me arbitrary in that it can offer no adequate reason why one historical instance of revolution should be preferred as model to another. If, as is frequently done, the French revolution is accepted as the model of revolutions, and if, in addition, as Brinton and many other writers have observed, it passed through successive stages from the rule of moderates to the rule of extremists, a reign of terror, and a Thermidorean reaction, then by extension the analogous sequence must be the case for other rev-olutions as well. As a result we see misguided efforts to trace out by means of strained arrangements of the facts the same succession of stages in such a revolutionary civil war of the sixteenth century as the Netherlands rebellion against Spain, where it scarcely applies and where the context also differs very markedly from that of the revolution in France. If the commencement of the revolt of the Netherlands is dated in 1566, with the great outbreak of iconoclasm and the first appearance of armed resistance to Philip II’s government, then it began with an extremist phase, not a moderate one.53 Moreover, the Netherlands rebellion as a whole presents to a certain extent an oscillation of phases, as illustrated by the moderate culmination in the Pacification of Ghent in 1576, rather than a steady intensification in a radical direction. I do not, to be sure, deny that revolutions have often displayed a tendency to develop toward increasingly extreme courses with concomitant changes in leadership. Nevertheless, such a sequence cannot be considered as either a law or the inevitable logic of revolution, to be imposed as a “fit” on every major revolutionary event. The acceptance of some particular historical instance as the paradigm for revolution seems to me to miss an essential point concerning the nature of typological descriptions. To repeat, the type is a constructed or fictional class and is not identical with the real. Hence, with regard to the revolutionary civil wars of sixteenth- and seventeenth-century Europe, for example, the Netherlands rebellion does not constitute the type, any more than do the French wars of religion, the English revolution, or the Fronde. All of them share some basic properties of the type, which is nevertheless not equal to any of its cases. By means of an appropriate typology, though, we can recognize in the revolutionary event as empirically presented the characteristics that cause it to belong to or approximate one type of revolution rather than another. And we can also ask fruitful comparative questions about variations and resemblances among cases of revolution of the same type as well as about possible parallels among revolutions of different types. In this connection we shall note again that we do not want our different types of revolution to be a reified or static set of classes. Instead, we should like them to signify, if they can, certain alternative structures of action and patterns of possible relations among the requisite criteria, which may in turn be co-ordinated with the conditions and processes in the world of early modern Europe out of which its actual revolutions were produced. 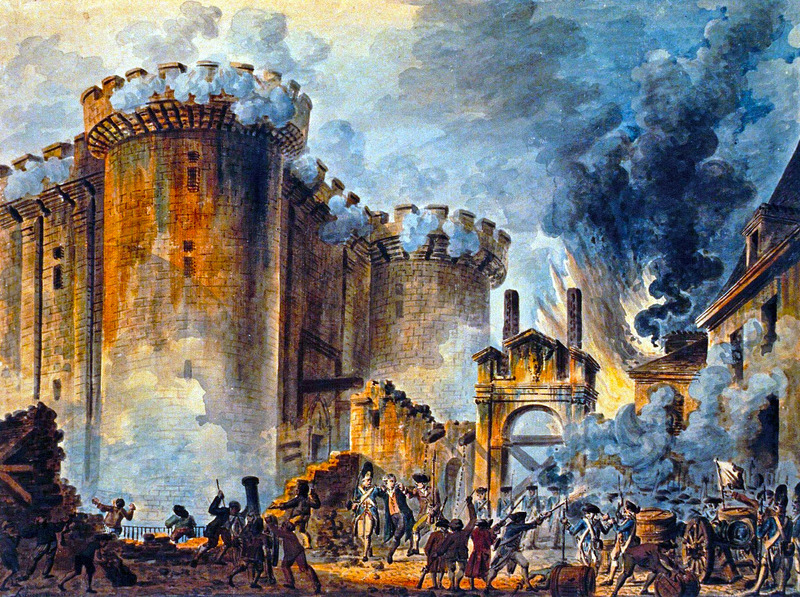 “The Storming of the Bastille” by Jean-Pierre-Louis-Laurent Houë. The scene depicts the arrest, on July 14 1789, of the governor of the Bastille, Bernard René Jourdan, Marquis de Launay (1740-1789). Besides typology, there is another fundamental problem that the comparative historian of revolution can hardly hope to avoid: causality. Does the comparative study of revolution have available to it any adequate causal theory that will serve its explanatory purposes? Traditionally, causality is the question upon which most of the intellectual effort devoted to revolution has concentrated. From Aristotle to the present, philosophers, historians, sociologists, political scientists, economists, and psychologists have grappled with it; however, despite the useful ideas that their writings sometimes present, no general theory has so far been developed by which we could predict future occurrences of revolution, or, if we prefer a less exigent standard than prediction, from which the causes of particular past revolutions could be deduced. We could cull many other causal explanations of revolution from the literature of the age. For some we might also find adequate confirmation and a particular application. But in what sense can they serve a general explanatory function? At most such causal accounts are partial and contingent, true maybe for certain cases but not for others. Perhaps they could be absorbed into a comprehensive theory of revolution; in themselves, though, they are incomplete and have no theoretical standing. Among the theories professing to provide a causal explanation of revolution, three in particular deserve notice. One is Marxist historical materialism; another is structural-functional social-systems theory; and the third is the theory of relative deprivation. As the Marxist theory of revolution has already been the subject of critical treatment in both this and the previous chapter, it may be left aside and our discussion focused on the other two. The central premise of structural-functional analysis is the conception of the functional social system as a state of homeostatic equilibrium. The causal process of revolution is accordingly held to begin with the inability of the system’s adaptive and adjustive mechanisms to cope with changes in the environment or in values, whether these changes originate from within or outside the society. The result of this inability in asynchronisation of different kinds, manifesting itself in disequilibrium and dysfunction. Should leaders and elites fail or refuse to take timely measures to restore equilibrium and reintegrate the social system, dysfunction will spread through various subsystems, giving rise to increasing protest and disaffection among the society’s members. Multiple dysfunction and elite incompetence or intransigence thus create the potentiality of revolution. Whether the latter occurs or not will then depend on the intervention of some particular event acting as an accelerator or trigger, such as the incumbent regime’s defeat in war or anything else that weakens its power and raises the confidence of its revolutionary opponents. Should such an event ensue, then revolution becomes highly probable or certain. The incurable weakness in this explanation of revolution, which seems to me to make it a pseudo rather than genuine causal account, is the emptiness of the idea of a social system in equilibrium. By this I mean that its defect does not consist of some particular empirical inadequacy but in its lack of content and the impossibility of specifying the criteria whereby the state of equilibrium and its opposite may be known. The anthropologist Levi-Strauss has remarked, “To say that a society functions is a truism; but to say that everything in a society functions is an absurdity. “63 Some such error appears to be entailed in the conception of a society in equilibrium. When Johnson describes the nonrevolutionary society as a state of equilibrium, he only tells us that it functions — which we know already —but tells us nothing as to what equilibrium is. To be sure, he does propose several tentative indexes of disequilibrium, such as the rate of suicide or the “military participation ratio”; but there is not the slightest reason to suppose that these necessarily indicate either disequilibrium or a potential for revolution unless we have first accepted the theory they are intended to confirm. Gun’s account is buttressed by a summary of findings by psychological experimenters that indicate a causal relation between frustration and violence — or, rather, a disposition of frustrated people to become violent in certain circumstances. RD is defined as a perceived discrepancy by individuals between their value expectations and their value capabilities, that is, between what they feel entitled to have and what they think they can obtain. The expectations subject to RD may include not only the values connected with economic security and material welfare (although historically these are what have been salient for most people) but also those pertaining to political status and participation and to personal development and moral beliefs. RD may occur either because expectations remain the same while capabilities decline (decremental deprivation), or because expectations increase while capabilities remain the same (aspirational deprivation), or, finally, because the two increase concurrently and then diverge as the J-curve sets in, making capabilities decline while expectations continue to rise (progressive deprivation). When any of these patterns prevails, men will express anger, frustration, and discontent. If RD becomes strong enough and is also focused on political objects, it can create a situ-ation leading to violence and revolution. Whether this happens depends on different variables, including the scope (extent of people affected) and intensity (depth of their reaction) of RD, the legitimacy ascribed to regimes, the presence and influence of ideologies sanctioning violence, and the means of coercion available to incumbents and dissidents. An example of the implicit adoption of these theories for such a purpose may be seen in some of the uniformities Brinton claimed to find among the English, American, French, and Russian revolutions. One of these is that all four societies were “on the upgrade economically before the revolution came, and the revolutionary movements seem to originate in the discontents of not unprosperous people who feel restraint, cramp, annoyance rather than downright crushing oppression.” Another uniformity is that the sharpest class antagonisms are felt by people “who have made money and contemplate bitterly the imperfections of a socially privileged aristocracy . . . Strong feelings . . are roused in those who find an intolerable gap between what they have come to want . . . and what they actually get.” “Revolutions,” Brinton further comments, “seem more likely when social classes are fairly close together than when they are far apart.”71 Although it is doubtful that the ascribed uniformities do in fact apply to all four cases, it is nonetheless apparent that, insofar as they hold, relative deprivation and reference group theory might help to explain them and that Brinton is making use of the two in his analysis. In a similar way, the ideologies of the normative past that have been noted as frequent in medieval and early modern rebellions, in which rebels appeal for justification to a past state of affairs, could be interpreted in some instances as an expression of decremental deprivation. In this case, value expectations have not changed, but discontented groups perceive a decline in their customary value positions and capabilities. As Gurr points out, “Decremental deprivation is probably most common in ‘traditional’ societies and in traditional segments of transitional societies.” He also speculates that, historically, it has been a greater source of collective violence than any other pattern of RD because “men are likely to be more intensely angered when they lose what they have than when they lose the hope of attaining what they do not yet have.”72 But it must be added as regards this particular pattern that decremental deprivation is merely a jargon term that obscures something more obvious and elemental; for what it signifies here is absolute deprivation, net loss, and oppression. Although the theory of relative deprivation may offer some useful insights to the study of revolution, its value on the whole seems limited, and it clearly fails to qualify as a general causal theory. That revolutionaries are discontented people is a truism, if not a tautology; but, as Gurr remarks, “most discontented men are not revolutionaries.”73 Between mere discontent and revolution an enormous distance intervenes. How do men traverse it? What RD reveals is only the socially derived source of discontent in the individual that makes him feel deprived. From this point the explanation must extend in continually widening circles to account for the discontent of many individuals, for the fact that they act together, become violent, are not effectively repressed, direct their violence at political instead of other targets, and are eventually mobilised in revolution. At every step on the way diverse causes and influences come into play that will determine whether the outcome is revolution or not, causes connected with economic and sociostructural developments, perhaps, or with political conflicts and changes, or with beliefs and ideologies. Although one might possibly attempt to incorporate these variables in the form of probabilistic empirical hypotheses, as Gun does, none is itself a derivative or inference from RD, which merely stands at the inception of the process. Thus, RD might at most state a necessary condition of revolution, but only one such condition, whereas additional necessary conditions would have to be sought elsewhere. Moreover, the theory of relative deprivation is also too narrow, compared with the variety of facts likely to be needed by historians and sociologists of revolution for their explanations. On the one hand, we have the three patterns of RD, three only, answering no doubt to the desire for parsimony but telling us little in themselves until the requisite historical material is brought into consideration. On the other hand, we have the complication of processes and the dense sequential texture of events that form the actual genesis of revolution in particular cases. How can all these be contracted to the compass of RD without impoverishment and the loss of vital explanatory elements? How can even the attitudes, sentiments, and perceptions that motivate revolutionary actors be understood in the single and exclusive terms of one or another of the patterns of RD? Even in societies where “decremental deprivation” and ideologies of the normative past are more apt to occur, the beliefs and demands of insurgents are rarely altogether nostalgic and lacking in germs of novelty; often they present a combination of defensive — retrospective and aggressive — innovative themes in their programs. Thus RD might easily lend itself to use as a formula that merely oversimplifies the intricacy of the revolutionary phenomenon. These reflections suggest some doubt as to whether it makes sense to envisage the possibility of any general theory of revolution. To qualify fully, such a theory would need to state both the necessary and sufficient causes of revolution such that the occurrence of the empirical conditions leading to revolution would be connected to their outcome by a universal causal law of the form: Whenever events and/or processes of the kind C, C1, C2, Cn, then Revolution, and whenever Revolution, then events and/or process of the kind C, C1, C2 Cn. Pretty clearly, a law of this nature seems unattainable, owing to the indefinite number and variety of causes required. Nevertheless, a theorist might perhaps feel reasonably satisfied if he were only able to specify the necessary causes, treating the latter as invariant preconditions, while relegating the sufficient causes to the realm of precipitants that are likely to consist of unique occasions and contingencies not susceptible of generalised causal formulation. However, even with this approach, which has been advocated as the means to facilitate systematic causal investigation of revolution, the obstacles to a generalized theory of revolutionary preconditions remain insuperable.74 Most writers on revolution have commonly recognized the necessity of multicausal explanations. Johnson is representative of this view when he states that the factors responsible for revolution “are as manifold as the elements comprising society itself” so that “the analyst must make use of sociological, psychological, military, and economic, as well as political, concepts.”75 More significantly, perhaps, historians of revolution, from whose works nearly all our real knowledge of revolutions is obtained, use a diversity of particular causes, whether broad or narrow, in their explanations and rarely pretend to possess a general causal theory; nor do they consider their explanation of a revolution to be weakened or invalidated if it cannot be universalised or subsumed under an alleged general law of the causal conditions of revolution. How, then, can the multicausal analysis of the theorist and the singular explanations of the historian be integrated into a comprehensive theory of revolutionary preconditions? To meet this difficulty, it is sometimes held that, because “many particular conditions” may be connected with revolutions, the investigator “should stress broad propositions about social processes and balances that can comprehend a variety of such conditions. “76 Plausible as this recommendation may appear, it would still fail to achieve the purpose intended. For the more extended the propositions about social processes become, the greater the difficulty of bringing them into deductive or even close relation to the specific phenomenon to be explained. Broad-gauged propositions concerning social conflict, anomie, and violence may perhaps be indispensable to explaining revolutions, but they may be equally necessary to explaining elections, strikes, suicide, crime, and war. They are too general to yield a statement of the preconditions of revolution. To be sure, they might lead us in the direction of some of these preconditions, but they would still have to be supplemented by less general propositions referring to revolutions exclusively. And the latter task brings us back to the same problem we started with of discovering all these propositions. There is, then, reason for scepticism concerning the likelihood of a general causal theory of revolution. Perhaps the truth may be that no causal propositions exist that apply universally to all cases of revolution — at least none that are not at the same time either vacuous or trivial. Finally, as regards the comparative history of revolution, it is surely not necessary to have uniform or identical causal explanations; resemblances and parallels will suffice. Comparative history merely presupposes that among the events, processes, and structures it selects for study there are to be found some correspondences, or some common and analogous features, the clarification of which will add to the understanding of the phenomenon in question. Lord Acton’s evocative description of the opening sixteenth century, even if somewhat hyperbolical, is in place here: “After many ages persuaded of the headlong decline and impending dissolution of society, and governed by usage and the will of masters who were in their graves, the sixteenth century went forth armed for untried experience, and ready to watch with hopefulness a prospect of incalculable change” (“Inaugural lecture on the study of history,” Lectures on modern history, London, 1930, 4). The Ottoman empire, an extra-European great power pressing upon Central and Western Europe, may be left aside; so may the state created by the Austrian branch of the Habsburgs, which did not begin to attain great-power status until the latter part of the seventeenth century. The Dutch republic, which as a result of its commercial, maritime, and colonial ascendancy became and remained a great power in the seventeenth century, was born out of the revolution of the Netherlands against Spanish rule. See J. R. Seeley, The growth of British policy, 2 v., Cambridge, 1895. This work, now apparently rather neglected, remains one of the most interesting and illuminating discussions of the European state system and great-power relations in the sixteenth and seventeenth centuries. Febvre, “Une Question mal posée: Les Origines de la réforme française” in Au coeur religieux du XVIe siècle, and ed., Paris, 1968, 58-9. A census of twentieth-century revolution is contained in P. Calvert, A study of revolution, Oxford, 1970, app. A, which lists 363 revolutionary events between 1901 and 196o. Data on civil strife in 114 polities in the 196os are collected in T. R. Gurr, “A comparative study of civil strife,” in Violence in America: historical and comparative perspectives, ed. H. D. Graham and T. R. Gurr, Washington, D.C., 1969. See also the remarks in T. R. Gurr, Why men rebel, Princeton, 1971, 3, 3n. A. Fletcher, Tudor rebellions, and ed., London, 1973; C. S. L. Davies, “Les Revoltes populaires en Angleterre (150o— 700,” Annales 24, 1 (1969). B. Porchnev, Les Soulèvements populaires en France de 1623 à 1648, trans. from the Russian, Paris, 1963; Y.-M. Berce, Histoire des Croquants: étude des soulèvements populaires au XVIIe siècle dans la sud-ouest de la France, 2 v., Geneva, .974; R. Pillorget, Les Mouvements insurrectionnels de Provence entre 1596 et 1715, Paris, 1975. V. L. Tapié (La France de Louis XIII et de Richelieu, Paris, 1967) has a useful review of the rebellions of Louis XIII’s reign (1610-43). R. Mousnier, (Fureurs paysannes: Les Paysannes dans les révoltes du XVIIe siècle, Paris, 1968) provides a review of seventeenth-century French peasant revolts in part 1. R. Bonney (Political change in France under Richelieu and Mazarin 1624-1667, Oxford, 1978, ch. 10) gives an overview of “tax” rebellions. J. H. Elliott, “Revolts in the Spanish monarchy,” in Preconditions of revolution in early modern Europe, ed. R. Forster and J. Greene, Baltimore, 1970. H. Kamen, The iron century 1560, 1660, London, 1971, chs. 9-10. See also now Y.-M. Berce’s brief survey of European revolts of the period, Révoltes et revolutions dans l’Europe moderne XVIe-XVIIIe siècle, Paris, 1980. R. B. Merriman, Six contemporaneous revolutions, Oxford, 1938. P. A. Sorokin, Social and cultural dynamics, 4 v., New York, 1937-41; volume 3, Fluctuation of social relationships, war and revolution, part 3 and appendix, contains data and tabulations on revolution based on a study of twelve countries and empires from 500 B.C. to A.D. 1925. Sorokin declares that he has derived his conclusions from “an examination of some seventeen hundred disturbances – a number never approached by any other investigation” (398). In analyzing his tables, I have had the valuable assistance of my two former doctoral students, Dr. William Bidwell and Dr. Ruben Garner. Nevertheless, chapter 12 carries the title, “Methodological study of revolution,” and Sorokin does not discriminate in his general remarks between internal disturbances and revolution. See ibid., app. to pt. 3, tables for the respective countries. The basis of this classification is described in ibid., 403. Ibid., app. to pt. 3. Ibid., table 47, 471, 486. The same data indicate that the sixteenth century is the eleventh most turbulent, the seventeenth century the eighth most turbulent, and the eighteenth century the fourteenth most turbulent. Ibid., table 35, 427, 429. Ibid., table 39, 454-55, and app. to pt. 3, table for Spain. Sorokin assigns the German peasant war a magnitude of 27.61, which makes it in his estimate the largest single disturbance in Germany—Austria between the later thirteenth century and 1918; see ibid., table in appendix to part 3. .
For Weber’s view of the ideal type, see his The methodology of the social sciences, ed. E. Shils, Glencoe, 1949, 89 ff. ; and the account of R. Bendix, “Max Weber,” in International encyclopedia of the social sciences, New York, 1968, v. 16, 495, 499-5.0. An interesting critical discussion of Weber’s typological ideas and of typological methods, their characteristics and limitations in general, based, however, it seems to me, on a too exigent notion of what sociology can accomplish, is given in P. Bourdieu, J.-C. Chamboredon, and J.-C. Passeron, Le Métier de sociologue, 2nd ed., Paris, 1973, 71 ff. and passim. Marx’s typology of revolution is sketched in The communist manifesto. The later Marx and Marxist thought also recognized national independence and colonial anti-imperialist revolutions as types but sought to assimilate them to the prevailing categories of bourgeois (antifeudal) and proletarian revolution. This attempt has generated both an endless amount of theoretical scholastic disputation and important strategic-tactical consequences in actual twentieth-century revolutions. C. Johnson, Revolution and the social system, Stanford, 1964, pt. 2, Revolutionary change, Boston, 1966, ch. 7. These typologies have been proposed respectively by J. Rosenau, L. P. Edwards, S. P. Huntington, and M. Hagopian. For references to them, see Johnson, Revolutionary change, 141; P. Zagorin, “Theories of revolution in contemporary historiography,” Political science quarterly 88, 1 (1973); and M. Hagopian, The phenomenon of revolution, New York, 1974, 101-6. T. Skocpol’s comparative study of the French, Russian, and Chinese revolutions includes a discussion of social revolution as a type in chapter 1 (States and social revolutions, Cambridge, 1979). For a general statement of this view, see the papers presented at the 1960 meeting of the historians of the German Democratic Republic (DDR) in G. Brendler (ed. ), Die frühbiirger-liche Revolution in Deutschland, Berlin, 1961. The main formulation is the contribution by Max Steinmetz, which contains the “theses” on the subject. A point of interest is Steinmetz’s observation that Soviet scholarship as late as the 1950s did not treat the German peasant war as an “early bourgeois revolution” but placed it instead among peasant outbreaks ranging from the Jacquerie of the fourteenth century to the Taiping rebellion of the nineteenth, while seeing the Dutch revolt against Spain as the first bourgeois revolution, then followed by the English and French revolutions (ibid., “Nachwort,” 304n.). However, the germ of the treatment of the German Reformation and peasant war as a bourgeois revolution goes back to classical Marxism; see F. Engels’s discussion to this effect in his “Introduction” (1892) to the English edition of his Socialism: utopian and scientific (1882). Forster and Greene, Preconditions of revolution, introduction. The typological distinction between conservative and modern revolution, with its im-plicit reference to the French and subsequent revolutions, has been particularly discussed in connection with the Castilian revolt of the Comuneros (see J. A. Maravall, Las comunidades de Castilla, 2nd ed., Madrid, 1970; and J. Perez, La revolution des “comunidades” de Castille, Bordeaux, 1970) and the Dutch rebellion (see H. A. Enno van Gelder, “De opstand tegen Philips II en de Protestantisering der Nederlanden,” Bijdragen voor de geschiedenis der Nederlanden 10, 1 (1955), and the reply to this article by L. Rogier, “Het karakter van de opstand tegen Philips II,” ibid. r o, 2-4 (1956), together with Enno van Gelder’s rejoinder to Rogier, ibid. 11, 2 (1956). G. Franz, Der deutsche Bauernkrieg, 9th ed., Darmstadt, 1972, 1, for the German peasant revolts; both this and the suggested categorization of French peasant and popular revolts are discussed in Ch. 7 of this book. F. Graus, Struktur and Geschkhte drei Volksaufttande im mittelalterlichen Prag, Sigmaringen, 0971, 27-8. J. Urry, Reference groups and the theory of revolution, London, 1973, 132. For spontaneity or calculation as a criterion, see Johnson, Revolution and the social system, 28, 30. A more recent example is the Peruvian revolution of 1968. The military junta that gained power in Peru by a coup d’état aimed to transform Peruvian society, and among its acts were various nationalisations and one of the biggest agrarian reforms in the history of Latin America. The fact that in Turkey, Egypt, and elsewhere military coups have been the means of significant change demonstrates that in some societies there are no forces or groups sufficiently strong and well organised to bring about revolutionary change other than armies and military elites. The coup of 1650 in the Dutch republic is discussed as a revolution by Merriman (Six contemporaneous revolutions, 71-88). See also P. Geyl’s description, which brings out clearly the coup’s political significance in the context of republican institutions and compares it with Charles I’s attempt in 1642 on the opposition leaders of the English House of Commons (The Netherlands in the seventeenth century: part two 1648—1715 London, 1968, 13-19). A more recent account is H. Rowen, “The revolution that wasn’t: The coup d’état of 1650 in Holland,” European studies review 4, 2 (1974). Both coups failed, the Gunpowder conspiracy because it was detected beforehand, the Dutch coup of 1650 because William II’s death a couple of months later undid its effects. For a discussion, see Zagorin, “Theories of revolution in contemporary historiography,” and Ch. 6 in this book. Although most revolutionary coups in the twentieth century have been dominated by the military, as in the majority of Latin American cases, the coups of early modern Europe were the attempts of dissident aristocrats. For the example mentioned in the text, see R. Mousnier, “The Fronde,” in Forster and Greene, Preconditions of revolution, 137-8; S. R. Gardiner, What Gunpowder plot was, London, 1897; J. E. Neale, Queen Elizabeth, New York, 1957, ch. 21; A. Dominguez Ortiz, Crisis y decadencia he la España de los Austrias, 3rd ed., Barcelona, ‘973, ch. See Chapter 1 in this book; and D. Thomson, The Babeuf plot, London, 1947. See A. Cobban, The social interpretation of the French revolution, Cambridge, 1964, for illustrations and discussion. Typical is Lefebvre’s remark that the French revolution “is only the crown of a long economic and social evolution which has made the bourgeoisie the mistress of the world” (cited in ibid., 8, from G. Lefebvre, Etudes sur la Revolution francaise, Paris, 1954, 246). A. Soboul, The French Revolution: 1787-1799, New York, 1975, is among the latest general statements of the position. Hobsbawm, “The crisis of the seventeenth century,” in Crisis in Europe 1560— 1660, ed. T. Aston, New York, 1965, 53; C. Hill, “The English civil war interpreted by Marx and Engels,” Science and society 12, (1948), and The English revolution 1640, 3rd ed., London, 1955; M. Dobb, Studies in the development of capitalism, New York, 1947, 176. See also Engels’s statement of the position in his “Introduction” to the English edition of Socialism: utopian and scientific. Porchnev, Les Soulévements populaires en France, pt. 3, chs. 1-2. “See also H. R. Trevor-Roper, “The general crisis of the seventeenth century,” in Religion, the Reformation and social change, 2nd ed., London, 1972, 52-5, for an effective criticism of the Marxist conception of the English revolution as “bourgeois,” and Ch. 12 of this book. Cobban, The social interpretation of the French revolution, 172. P Goubert, L’Ancien Régime, and ed., Paris, 1969, 257. See also G. Taylor, “Non-capitalist wealth and the French Revolution,” American historical review 72, 2 (1967), for a convincing critique of the interpretation of the French revolution as a bourgeois revolution. As he points out, “Between most of the nobility and the proprietary sector of the middle classes, a continuity of investment forms and social-economic values . . . made them, economically, a single group. In the relations of production they played a common role.” Skocpol (States and social revolutions, 174-9) also presents some doubts about the “bourgeois revolution” thesis applied to France. See Zagorin, The court and the country, chs. 1-2, and L. Stone, The causes of the English revolution 1529-1642, London, 1972, 39-40, 54, 71-2. R. Mousnier, “Recherches sur les soulèvements populaires en France avant la Fronde,” in La Plume, la faucille, et le marteau, Paris, 1970, for a convincing refutation of Porchnev’s misconceptions. F. Furet, “Le Catechisme de la Révolution française,”Annales E.S.C. 26, 2 (1971), 279. The whole essay is an acute criticism of the orthodox interpretation of the French revolution. The place and importance of judgment, insight, and methods not generalizable in a manual of scientific procedure are clearly and profoundly brought out by K. Polanyi (Personal knowledge, London, 1958). See P. Bourdieu, “Structuralism and the theory of sociological knowledge,” Social research 35, 4 (1968), 697. See the discussion concerning the applicability of Brinton’s model to the Netherlands rebellion by G. Nadel, “The logic of The anatomy of revolution with reference to the Netherlands revolt,” Comparative studies in society and history 2, 4 (1960); G. Griffiths, “The revolutionary character of the revolt of the Netherlands,” ibid. 2, 4 (1960); and I. Schafer, “The Dutch revolt anatomised: Some comments,” in ibid. 3, 4 (1961). Interesting observations and reservations about Brinton’s and the French revolutionary “stage” or “phase” model are offered by Hagopian (The phenomenon of revolution, ch. 5). F. Bacon, “Of seditions and troubles,” Essays (1625). This was not only Granvelle’s view but was also held by contemporary memoirists like Hopperus and Pontus Payen, who remained loyal to Spanish rule. Payen connected the emphasis on noble indebtedness and discontent to historical recollections of Catiline’s conspiracy in republican Rome. I am persuaded that this explanation of revolution in the sixteenth and seventeenth centuries often derived from classical reminiscences and influences; see the remarks of these writers cited in E. Marx, Studien zur Geschkhte des Niederldndischen Aufstandes, Leipziger Studien aus dem Gebiet der Geschicbte, v. 3, Leipzig, 1902, 112-14. Sir Edwin Sandys, cited in J. Thirsk and J. P. Cooper (eds. ), Seventeenth-century economic documents, Oxford, 1972, 1; for “conjuncture” and the economic context of revolution, see Chapter 5 in this book. J. Bodin, Les Six livres de la république, Paris, 1576, bk. 4, ch. 1. I use the English translation by Richard Knolles, The six bookes of a commonweal, ed. K. D. McRae (1606; reprint ed., Cambridge, 1962). For a survey and discussion, see Zagorin, “Theories of revolution in contemporary historiography”; L. Stone, “Theories of revolution” in The causes of the English revolution 1529- 1642 ; and Hagopian, The phenomenon of revolution. Some of the writings cited in the following notes also contain useful analyses and criticisms of both older and more recent theories of revolution. Edwards, The natural history of revolution, Chicago, 1927; G. Pettee, The process of revolution, New York, 1938. N. Smelser, Theory of collective behavior, New York, 1962. A critique of structuralist-functionalist theories generally, including a discussion of both Smelser’s and Chalmers Johnson’s theories of revolution, is given in A. D. Smith, The concept of social change, London, 1973; see also B. Salert, Revolutions and revolutionaries: Four theories, New York, 5976, which deals with Johnson and several other writers, including Gurr, treated in the present chapter of this book. Johnson, Revolution and the social system; Johnson, Revolutionary change. C. Levi-Strauss, Structural anthropology, New York, 1963, 13. Cited from Alexander Gerschenkron’s critique of Parsonian theory by N. Smelser, Essays in sociological analysis, Englewood Cliffs, 1968, 218n. A similar confusion appears in Smelser’s own description of equilibrium (ibid., 211), which is in reality no more than the description or definition of a system. See the related criticism of Smith: “The trouble with the functionalist answer is that its alternative to equilibrium is the unstructured anarchy of anomie. Whereas what we discover repeatedly are patterns of group conflict and multiple tension and `dysfunction,’ rather than synchronous equilibrium or normative breakdown” (The concept of social change, 120). Attempts to draw on Johnson’s ideas in the historical explanation of revolution follow this procedure; see Stone, The causes of the English revolution 1529-1642. In a preliminary version of this essay, Stone ascribes its “theoretical framework” to Johnson; see Forster and Green, Preconditions of revolution, 65n. A. de Tocqueville, The old regime and the French revolution, trans. S. Gilbert, New York, 1955, 176-7. J. C. Davies, “Toward a theory of revolution,” American sociological review 27, I (1962), and “The J-curve of rising and declining satisfactions as a cause of some great revolutions and a contained rebellion,” in Graham and Gurr, Violence in America. E. T. Gurr, Why men rebel, Princeton, 1970. The idea of “relative deprivation” first appeared under this term in S. Stouffer et al., The American soldier, 2 v., Princeton, 1949. It was further generalized and connected with the theory of reference groups by R. K. Merton and A. Kitt. For a general account and discussion, see “Reference groups,” International encyclopedia of the social sciences, New York, 1968; and W. G. Runciman, Relative deprivation and social justice, Berkeley, 1966. An interesting variant and application of RD is presented in A. O. Hirschman, “The changing tolerance for income inequality in the course of economic development,” Quarterly journal of economics 87 (1973), which focuses on the “tunnel effect.” A recent discussion of these ideas in connection with revolution is available in Urry. Brinton, The anatomy of revolution, ed. 1965, 250—I. In this edition, Brinton takes cognisance of J. C. Davies’ work of 1962, which he attempts to incorporate, but the same uniformities and underlying ideas appear in the original 1938 edition. Gurr, Why men rebel, 48, 50. H. Eckstein, “On the etiology of internal wars,” History and theory 4, 2 (1965). Johnson, Revolutionary change, xi; see also Eckstein, “On the etiology of internal wars,” 88. Eckstein, “On the etiology of internal wars,” 34. Among the key contributions to this extensive literature are C. Hempel’s “The function of general laws in history,” reprinted in P. Gardiner (ed. ), Theories of history, New York, 1959; and W. Dray, Laws and explanation in history, Oxford, 1957. Hagopian, The phenomenon of revolution, 123. Brinton, The anatomy of revolution, 251. In discussing the “transfer of the allegiance of the intellectuals” as a causal uniformity, Brinton makes his strongest case for it in connection with the French revolution, whereas his treatment of it in relation to the English and American revolutions is more tentative (ibid., 39-49). Stone, The causes of the English revolution 1529-1642, 146. Besides Johnson’s, the theories Stone uses in this work include the J-curve, relative deprivation, and status inconsistency, the last proposed by G. Lenski as “a way of linking social and economic change to revolution” by showing that “a society with a relatively large proportion of persons undergoing high mobility is likely to be in an unstable condition” (ibid., 125, 134, 54). Smith, The concept of social change, 94.